Omnilux blue™ has been specifically developed to target the naturally occurring photosensitiser, Coproporphyrin III, found in P.acnes bacteria. Omnilux blue™ is the most potent blue light source in activating the target photosensitiser, producing singlet oxygen that leads to rapid eradication of the P.acnes bacteria. The output of Omnilux blue™ is also optimized to activate the photosensitiser 5-aminolaevulinic acid and is therefore ideally suited for the treatment of Actinic keratosis. Omnilux blue™ delivers 40mW/cm2 48J/ cm2. Omnilux Blue for AcneAcne is one of the world’s most common skin conditions, affecting over 85% of adolescents by the age of 24 years and up to 50% of adults over 25 years of age. Acne is a widespread and upsetting condition. It can produce lifelong physical and emotional scarring. Acne is NOT caused by bad diet or greasy foods. In fact, acne develops when the sebaceous glands in a person’s skin produces excess oil (sebum). This oil combines with cells that line the gland walls and clogs the skin’s pores. 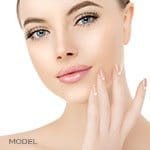 Normal skin bacteria colonize these pores and the body’s response causes the inflammation or reddening of the skin that we associate with acne. How does Omnilux™ light therapy work? One of the key bacteria responsible for the inflammation is Propionibacterium acnes or P.acnes. These bacteria produce natural chemicals called poryphyrins, which are sensitive to light at different wavelengths. If stimulated, these chemicals will neutralize the bacteria and with no bacteria present inflammation will subside. Omnilux blue™ stimulates these chemicals and so eradicates the bacteria that cause the redness or inflammation of acne. This is combined with Omnilux revive™ which has anti inflammatory properties, this helps to minimize the redness of acne lesions and promotes healthier skin. Omnilux treatments are totally non-invasive and generate no heat. The treatment does not damage normal tissue and works with the body’s own natural processes to rejuvenate the skin. Why choose Omnilux combination light therapy for acne? Omnilux is an essential tool as part of an acne management program. Omnilux™ delivers pure light optimized to deliver the correct wavelength and dose for maximum activation of the target cells. Combination phototherapy works through the anti-bacterial and anti-inflammatory activity of Omnilux blue™ and Omnilux revive™ delivered alternately. Only by delivering the right wavelength in sequence can optimum results be seen. Activation of coproporphyrin III creates intracellular singlet oxygen – inducing complete bacterial death. This reduces the bacterial colonization of the sebaceous gland, returning the gland’s abnormally high level of sebum to normal and reducing the production of pro inflammatory cytokines. Simultaneously, Omnilux blue™ induces anti-inflammatory cytokines, stimulating specific immunoregulatory pathways. The intracellular specificity of red light therapy (Omnilux revive™) is well documented and it has long been demonstrated that 633nm offers excellent reduction in inflammatory lesions and is proven to stimulate cellular mechanisms for tissue repair. 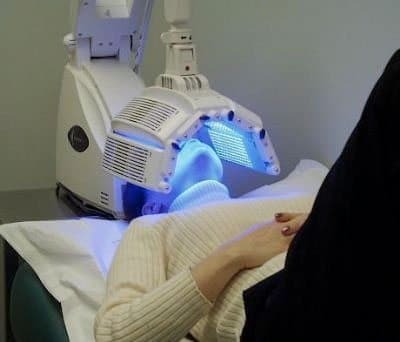 In a recent study 16 subjects (skin types I-IV, all with mild to moderate acne vulgaris or moderately severe cystic acne) were treated with alternate Omnilux blue™ and Omnilux revive™ light therapy. A mean clearance rate of over 82% was seen 12 weeks after the final treatment. omnilux blue treatment1. Either 8 alternate Omnilux blue™ and Omnilux revive™ or 8 Omnilux blue™ treatments over four weeks. 2. Allow At least 48 hours rest time between treatments. Because there is no heat involved, there’s no pain! 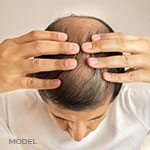 – Highly effective, no side effects, no irritation and it is quick and simple.